Friday 26th July. 7:30 p.m. for a prompt 8:00 p.m. start. Please register your interest by contacting Sam Greaves on Mobile 07950 644861 or Tom Greaves on 07787 243915. Friday 17th May. 7:30 p.m. for a prompt 8:00 p.m. start. Please register your interest by contacting Sam Greaves on Mobile 07950 644861 or Tom Greaves on 07787 243915. Saturday 20th October. 7:00 p.m. for a prompt 8:00 p.m. start. Please register your interest by contacting Sam Greaves on Mobile 07950 644861 or Tom Greaves on 07787 243915. Friday 3rd August. 7:00 p.m. for a prompt 8:00 p.m. start. Please register your interest by contacting Sam Greaves on Mobile 07950 644861 or Tom Greaves on 07787 243915. Friday 3rd August. 7:00 p.m. for a prompt 8:00 p.m. start. And your starter for 10. 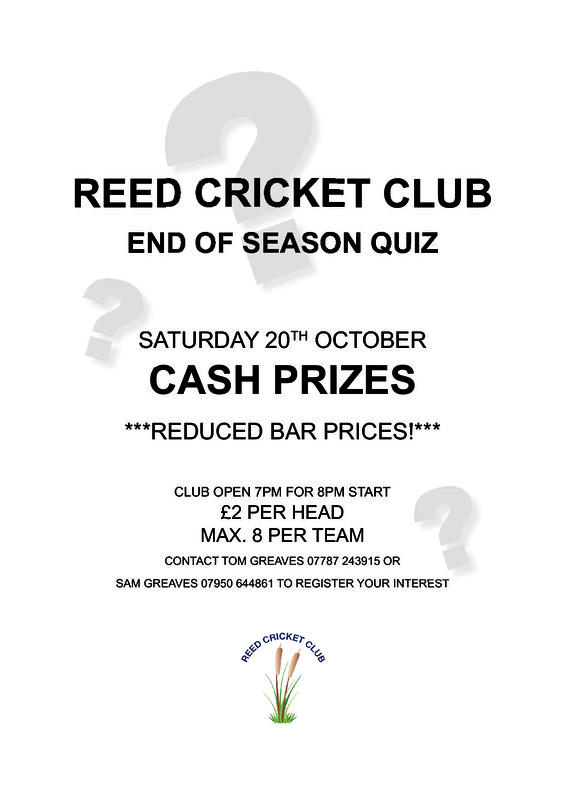 Q: How many Quizzes is Reed CC holding in 2018? A: Two. Yes, two. The first was in June with veteran Quizmaster Matt Bowles asking the questions. Now, a new look and a new variety of teasers with Sam Greaves taking the chair. Will last time’s winning team, “Not All Legless”, be going for the double? Not far behind, Super Best Friends came second equal with We don’t know - (yes, we do know; the team’s name was We Don’t Know)! Book early - see phone numbers for Sam and Tom. 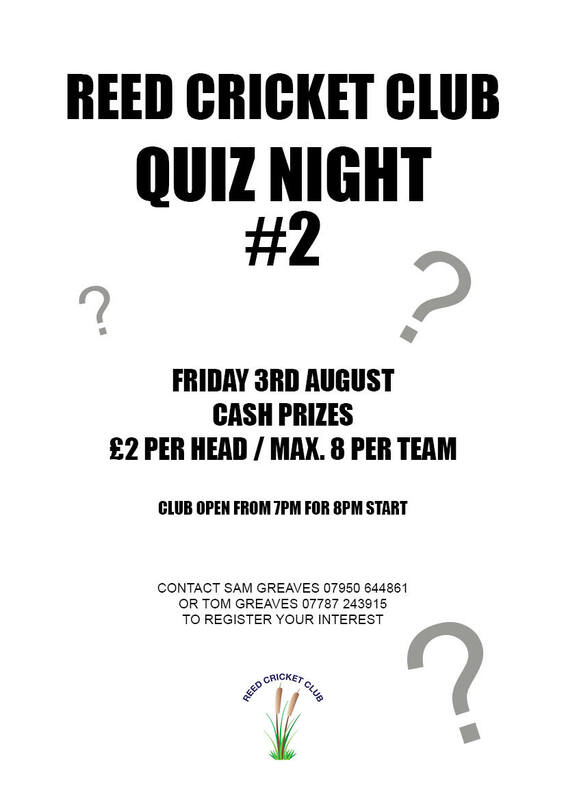 Please see the attached poster advertising the first of this summer’s Quizzes. 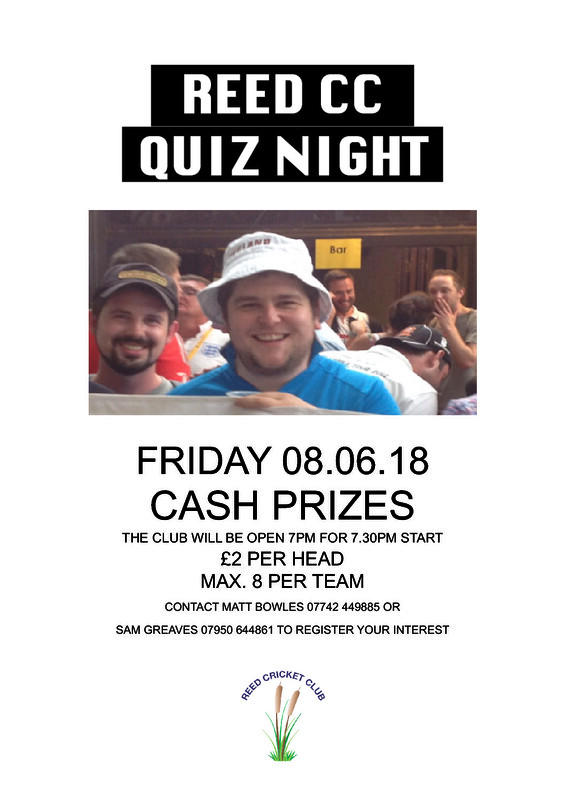 It is on next Friday the 8th June. Contact Matt Bowles or Sam Greaves to book.